1 Armed Russian sailors walk near the Ukrainian ship Slavutich in Sevastopol, March 20, 2014. 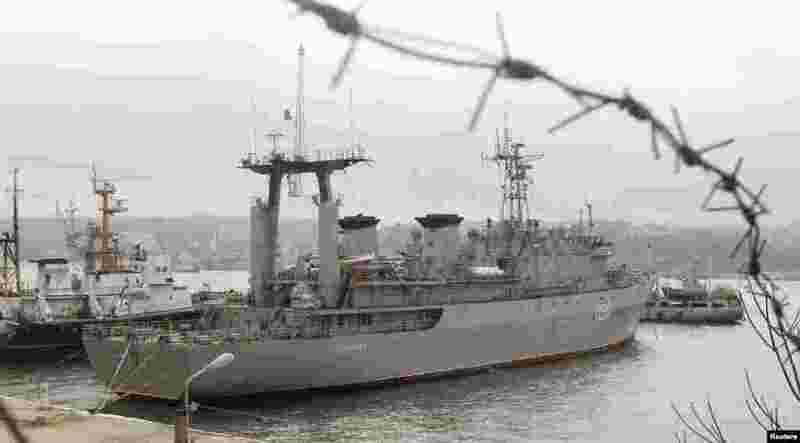 2 The Ukrainian ship Slavutich is seen blocked by two Russian ships at the harbor in Sevastopol, March 20, 2014. 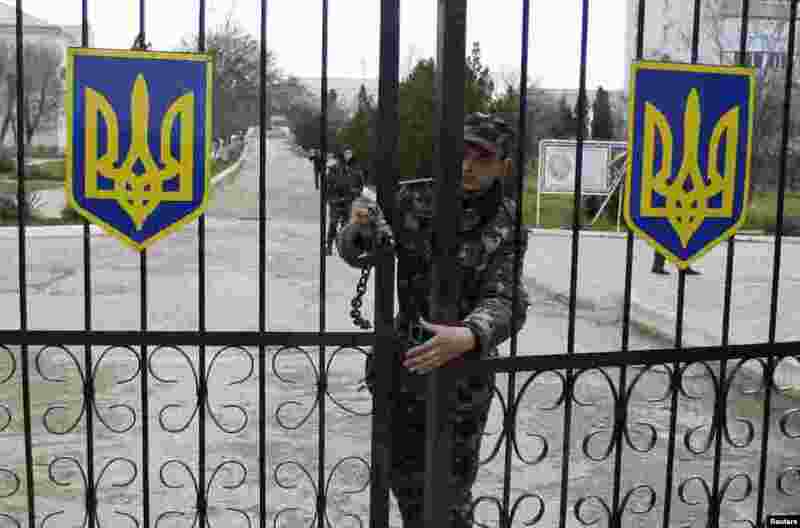 3 A Ukrainian soldier closes an entrance gate at the air force base in the Crimean town of Belbek, March 20, 2014. 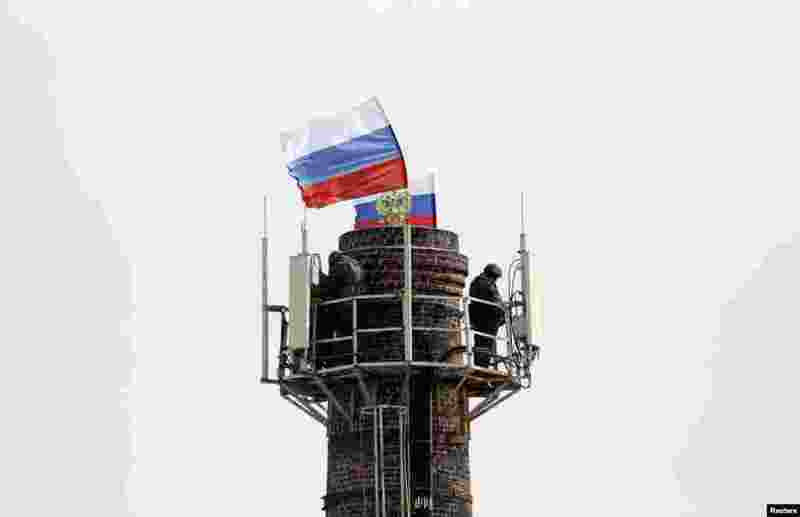 4 Armed men, believed to be Russian servicemen, stand guard at the top of a chimney located near the naval headquarters, with Russian flags installed nearby, in Sevastopol, March 19, 2014. 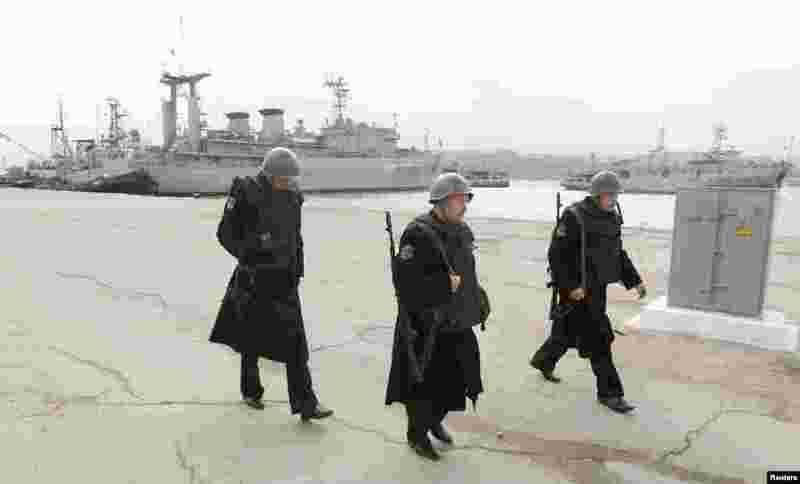 5 Armed men, believed to be Russian servicemen, walk on the territory of the naval headquarters in Sevastopol, Crimea, March 19, 2014. 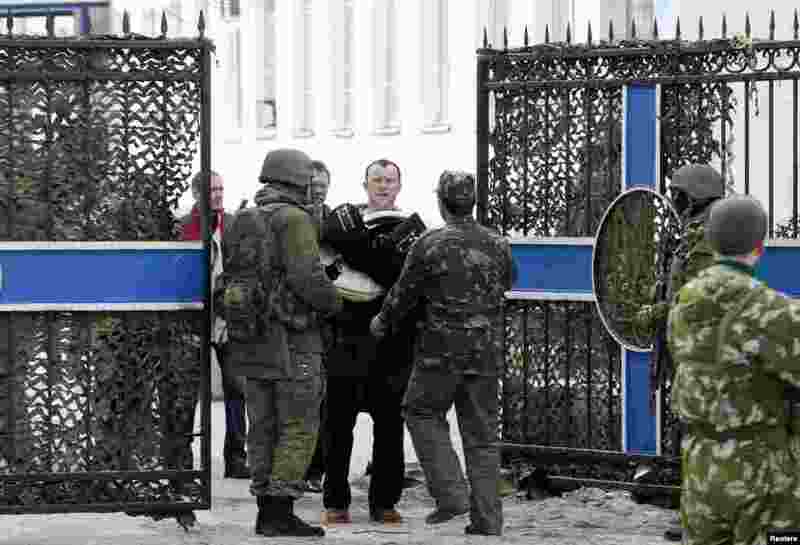 6 A Ukrainian naval officer carries his belongings as he walks out of the territory of the naval headquarters, with armed men, believed to be Russian servicemen, seen nearby, in Sevastopol, March 19, 2014. 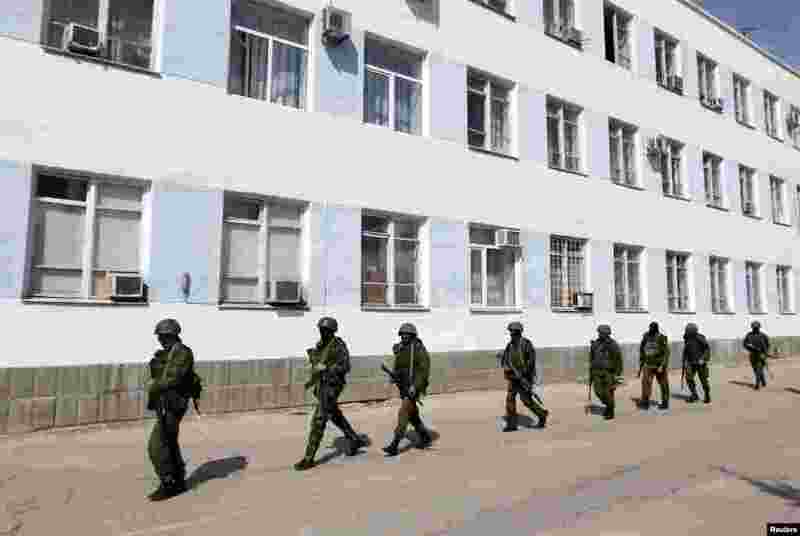 7 Members of Crimean self-defense units walk in formation while leaving the territory of the naval headquarters in Sevastopol, March 19, 2014. 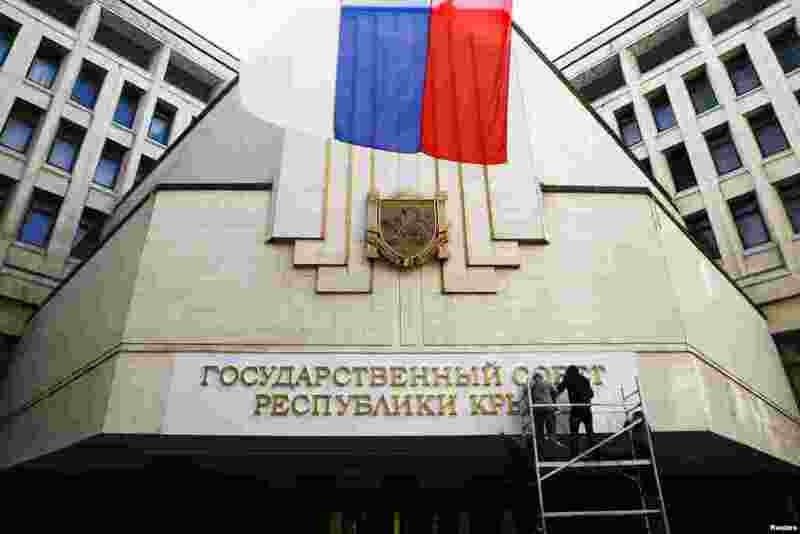 8 Workers put up a new sign reading "State Council of the Crimean Republic" at the parliament building in Simferopol, March 19, 2014. 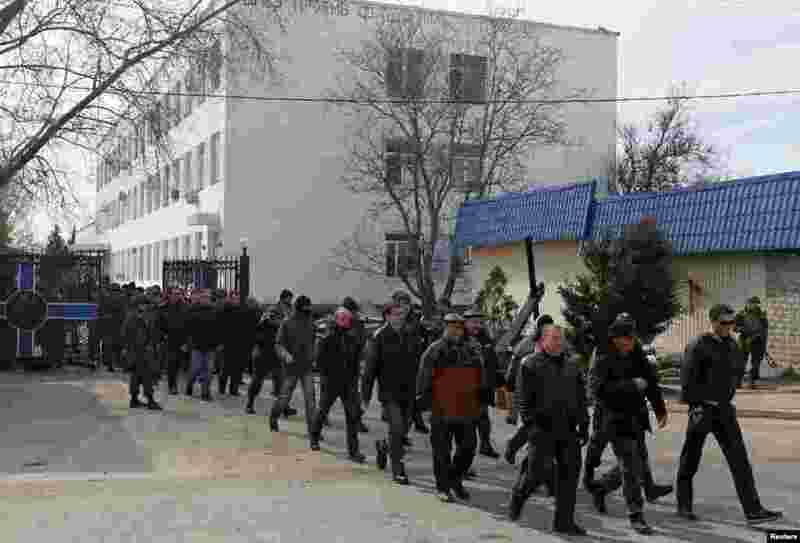 9 Workers remove old letters from the Crimea parliament building in Simferopol, March 18, 2014. 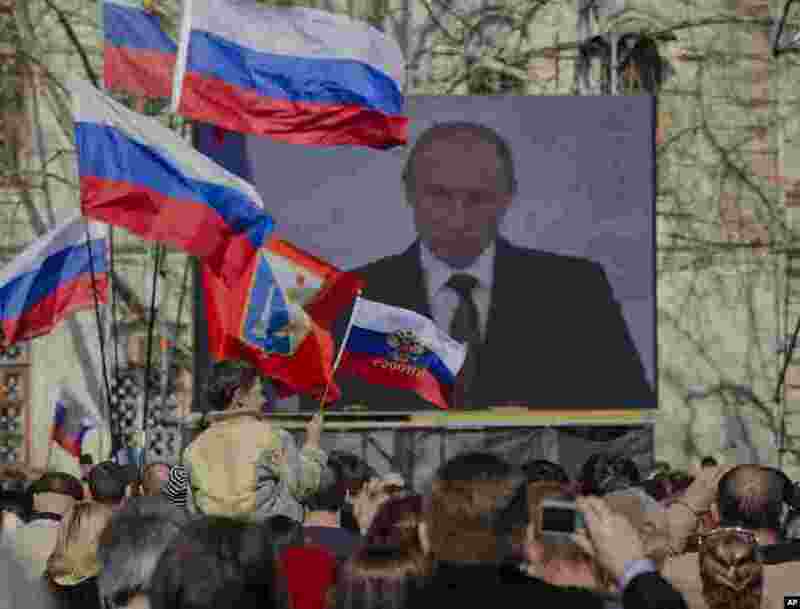 10 Pro-Russian people watch a live broadcast of Russian President Vladimir Putin's speech on Crimea in Sevastopol, Crimea, March 18, 2014.